Fire ants live and do most of their foraging for food through underground tunnels. Their nest consists of a network of chambers occupying a vertical column 12-18" in diameter and approximately 36" deep. Following rainy weather, the fire ants clear blocked tunnels and expand chambers to create a mound of loose soil above the nest to safeguard from flooding. The colony dwells in this above ground extension when the temperature is optimal for brood development. Though above ground mounds harden and persist in some soil types, their absence does not mean fire ants are not present. Fire ants often rest near concrete walkways and driveways because the surface retains heat for the nest. Since their introduction from South America in about 1918 through the port of Mobile, Alabama, imported fire ants have spread into our area through natural migration and "hitchhiking" on plants, sod, and nursery stock from Florida, South Alabama, South Georgia, and Texas. Colonies of fire ants consist of eggs, brood, workers, winged males and females and one or more reproductive queens. Among the sterile workers, labor is divided by age and size. Younger workers are assigned the job of caring for the developing brood; older workers are tasked with colony maintenance and protection while the eldest workers forage for food. Fire ant workers in the mounds are identified by their reddish brown color and small size. The reproductive male and female fire ants are larger and more numerous. The queen lives up to seven years and produces an average of 1,600 eggs per day throughout her life. A fire ant colony can consist of over 250,000 ants. These fire ants feed on a wide variety of food, including insects and plant seeds, and prefer land exposed to the sun. In urban areas, fire ants invade our lawns, parks, play grounds, school yards, cemeteries, golf courses and even sidewalk cracks. Fire ants also enter air conditioners and other electrical equipment as they search for food and moisture. Fire ants have a severe bite and sting and will attack anything that disturbs their nest so be careful not to step on the nest, rake, or mow over the mounds. Each ant is capable of stinging several times and the sting causes a burning or itching followed by the formation of a white pustule. Scratching may lead to a secondary infection and scarring. Some people who are allergic to wasp and bee stings are also allergic to fire ant stings. Treatments for fire ants include a combination of broadcast baits and mound treatments. Your pest management professional will assess the infestation and determine the most effective treatment of liquid or granular products. Because these ants are scavengers as well as predators, treatments are typically two-step and include a direct mound application using a drenching method with an injection rod as well as broadcast sprays, dusts, granules or baits. Applying baits in the late afternoon or early evening when the fire ants are most active is optimal. Low toxicity and non-chemical treatments are available but they are often slower and their effect is minimal. Some people may use home remedies like gasoline to burn fire ant mounds, thinking it is better than a perceived dangerous pesticide. Pesticides are really much safer and are designed to break down quickly in the environment and few pose long-term contamination problems. Gasoline will kill nearby plants and grasses and could severely burn the user and enter the ground water supply. Other home-remedies of pouring boiling water, grits, rice and other "expanding" grains on the mounds also are not effective and boiling water can burn and injure the user and kill grasses and plants. Fire ants are a fact of life in this area. With persistence fire ants can be managed and controlled. I received several fire ant bites while walking across the parking lot at work. What can be done about these fire ants? Yours are probably typical raised fire ant stings. They do burn as you well know and this is where their name originates. With wet weather, fire ants increase in number with more nests and larger nests in our area. For fresh stings, wash the area with soap and water to immediately flush the toxins or venom. Over the counter antihistamines help prevent allergic reactions and swelling. In fact, our Enviroguard pest management technicians keep a supply on their service vehicles in case they are stung. Hydrocortisone creams also help and I have read about other home remedies including meat tenderizer and water or baking soda and water and even a crushed aspirin in water to make a thick paste. Ice may reduce pain and itching and you should avoid scratching the raised bump. Treat stings that become infected. If you are severely allergic and experience chest pain or slurred speech or difficulty breathing, seek immediate medical attention. In your walk across the parking lot, you may not have noticed the fire ant mound probably on the grass island. Smaller mounds may be even with the ground. 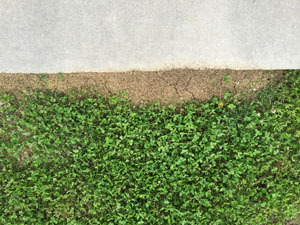 On areas where the grass is uneven, mounds are often harder to spot than they are emerging from a lush, even green lawn. You stepped on the top of their nest and disturbed the fire ants. They then emerged and climbed your foot and leg. They are small so you may not have felt them climbing until the sting – which occurs just after the bite. They release pheromones and other ants join them in the attack, hence the multiple bites around your ankle. The same ant may sting several times and you often see the stings in a semi-circular pattern like on your leg. For the future, prevention is key. Avoid fire ant mounds and be careful of your surroundings. Of course, it would be easier to prevent fire ant bites if there are no fire ants. 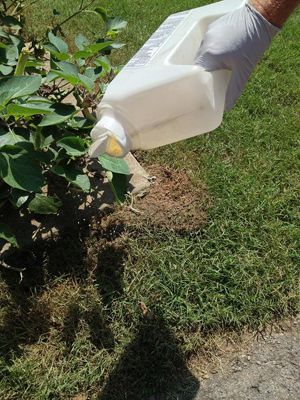 Enviroguard recommends fire ant elimination with baits and liquid insecticides in a year-round program of control. Use of granular baits around the nest slowly kills the entire colony. It may take several weeks to kill the colony but it will not prevent the entry of new ant colonies invading from nearby areas. Early spring application is ideal because it controls recently developed queens before they leave on their flights to establish new colonies. Killing the queens is the only way to eliminate fire ant colonies. Follow-up granular bait applications usually are necessary in mid-summer and fall. Using gasoline, hot water, bleach, and other home remedies in an attempt to kill a colony only causes the fire ants to spread or move to another site.